Modern application environments demand a fast release cycle for new versions of an application. Continuous Integration defines that every change (commit, etc.) is iteratily tested to not break a deployable application. So every code change is tested to be integrable in the existing code base. Continuous Delivery as an extension of Continuous Integration, demands that every deployable artifact resulting from Continuous Integration is actually automatically deployed to a staging enviroment for some kind of (manual) acceptance tests. As for most time in IT terms are not excactily defined. So don't be confused when searching accurate definitions for that terms. Software vendors often use Continuous Delivery and Continuous Integration (and Continuous Deployment) in different ways. In this post i will describe how to setup a Continuous Delivery cycle with a IBM WebSphere Application Server as deployment target. Though WebSphere is an closed source properteriy product, it offers interfaces for automatic deployments. So its possible to bring the closed source and the open source world a bit more closer together. I will use Git 1.8.1.2 as SCM, Jenkins 1.587 as Continuous Integration-Server and of course WebSphere 8.5.5. as the deployment target. For directly triggering a build after a commit i will use the git post commit hook. For deploying the application i will use the WebSphere Deployer Plugin. I also created a maven based sample application with a basic JUnit test. The project can be downloaded here. Basically it doesnt matter if the tools will be installed on seperate machines. However i installed them all on my local PC to keep the complexity and the debug effort low. I skip the installation of the basic tools as they are straight forward and continue with the plugin installation for Git and Jenkins. Git has some built-in extensions called hooks. To activate a hook locate a sample script in your Git installation and simply edit it. In this example we need the post-commit.sample file. The file just needs to contain a single line that tells git to call a jenkins url that triggers the build in jenkins. The easiest way to deploy your changes to WebSphere is the WebSphere Deployer Plugin for Jenkins. and search the "WebSphere Deployer Plugin". Select the plugin and click "Download now and install after restart". Choose "Restart Jenkins when installation is complete and no jobs are running" to restart Jenkins directly afterwards. The successfully connect to WebSphere, the WebSphere Deployer Plugin needs additional libraries. When working with WebSphere liberty, other libaries are required. Refer to the official documentation for more information. After copying the libraries Jenkins needs another restart. After the basic setup is completed and the plugins are installed the build pipeline in Jenkins can be configured. Go to the Jenkins web interface and click "New Item". Type in your item name and select "Maven project" as the item type. After clicking "OK" the job config dialog appears. Under Source Management select Git and enter your git-repository. Since i am setting up this example on my local machine i just enter the local Git repository path. If you have a Git management tool like gerrit or Atlassian Stash you need to enter the approperiate URLs. Under "Build triggers" select "Poll SCM". Ignore the warning Jenkins prints out for not specifying any scheduling interval. 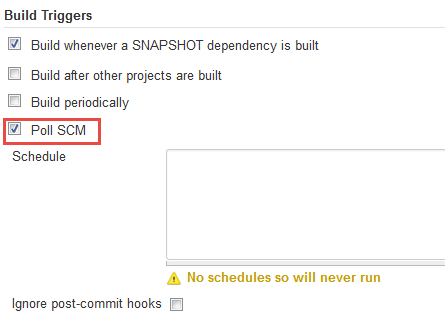 No schedule intervals are needed when using post-commit hooks. However it is necessary to active "Poll SCM". recommand to activate post build steps (like deployments) only for working builds. So select "Run only if build succeeds" under "Post Steps". 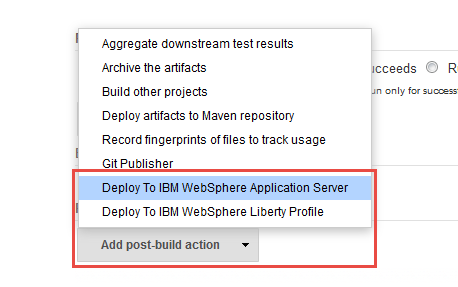 To enable the deployment to WebSphere after a successfull build click "Add post-build action" and select "Deploy To IBM WebSphere Application Server" or "Deploy To IBM WebSphere Liberty Profile". In this example i will use the full blown IBM WebSphere Application Server so i choose the first option. The WebSphere Deployer Plugin is highly configurable. Need do not need to fill out all values. However basic settings are the WebSphere host name (localhost) the Connector Type (SOAP as default) and the corrosponding Port (8882 here - default is 8879). The port settings can be retrieved from the WebSphere settings (Application servers > server1 > Ports > SOAP_CONNECTOR_ADDRESS). The settings for the "Target Node", the "Target Cell" and the "Target Server" depend on your installation. However all values can be retrieved from WebSpheres Administrative Console. Also choose Java EE 6 as the "Generated EAR Level". Thats it. Click "Save" to create the job (aka the build pipeline). 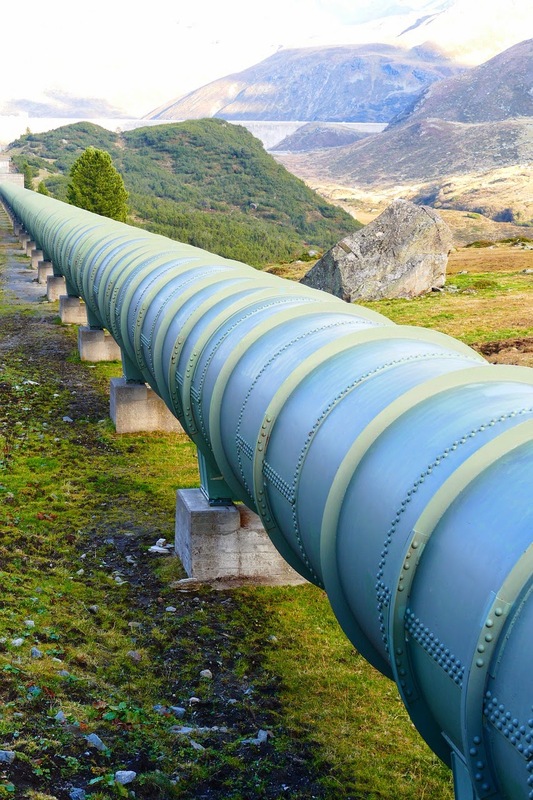 We build a basic continuous delivery pipeline for WebSphere. results in a curl call on a Jenkins action url. The call on this url says Jenkins to start a poll for the corresponding git repository. 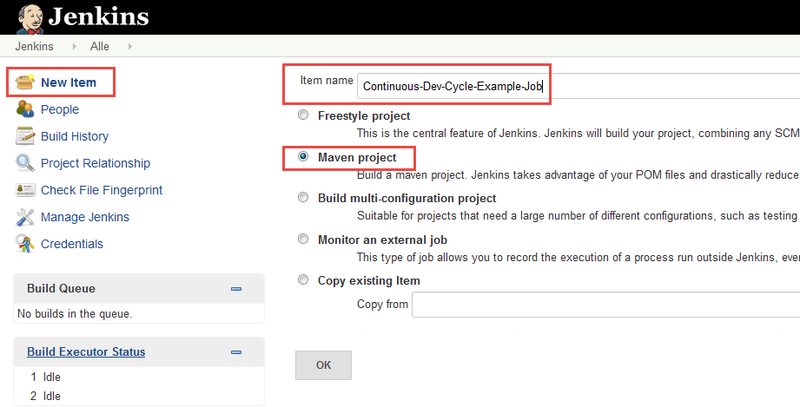 Jenkins builds the maven project, executes the JUnit-Tests. 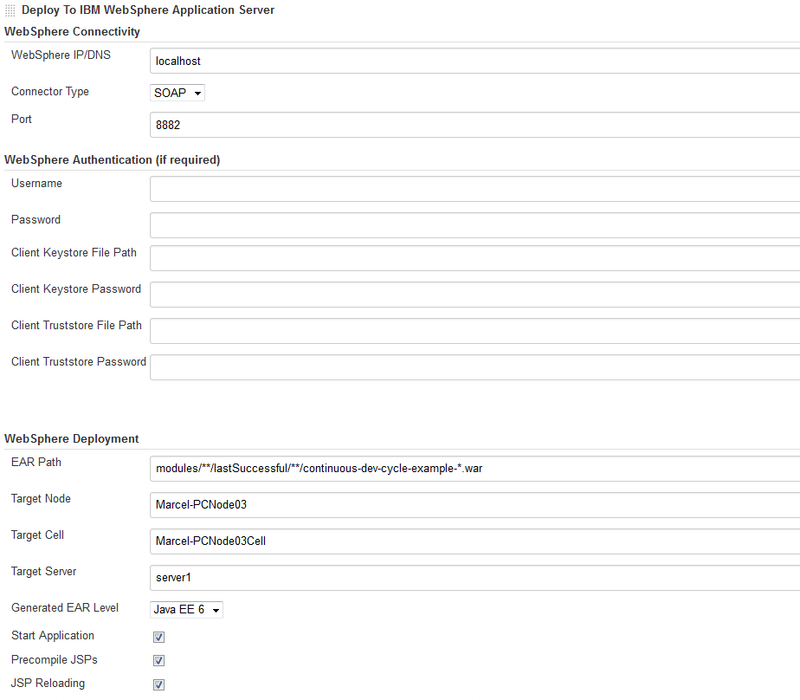 After a successfull build the WebSphere Deployer Plugin deploys the application to the WebSphere Application Server. Which file did you modify where it shows Update 6! ?